Billions of dollars for bikes were at stake on November 8 through city and county ballot measures that will finance transportation projects. Voters came out in force to support bike riding, and approved $4.7 billion in funding for new bike facilities. 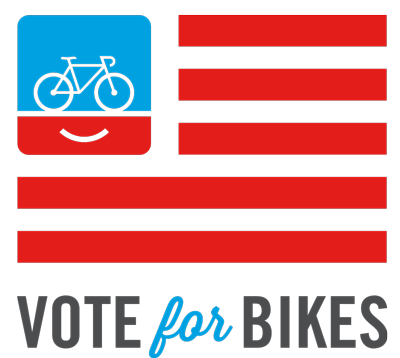 Check out our ballot tracker to see which cities, counties, and states will be making new investments in bicycle infrastructure. Measure X will generate approximately $2.8 billion during the next 30 years for new transportation projects. This money will be generated by a 1/2 cent increase in sales tax. The measure will dedicate $115 million to bicycle and pedestrian projects, and also set aside another $58 million for complete streets. The Transportation Agency for Monterey County has put forth a ballot measure that would generate $600 million for infrastructure projects by increasing the sales tax by 3/8 of a percent for 30 years. At least $40 million of this revenue will be dedicated to bike paths and safe routes to school programs, with additional spending on bikes occurring through local road projects. Click here to learn about Measure E, another Monterey County ballot measure. Measure M will raise the sales tax rate in Los Angeles County by 1/2 cent in order to fund a massive investment in the county’s transportation infrastructure over the next 40 years. The expenditure plan includes $3.9 billion in investments for bike infrastructure. Measure B will provide new funds for the Santa Clara Valley Transportation Authority by increasing the sales tax by 1/2 cent for the next 30 years. This will generate $6 billion, of which $250 million is allocated to bike infrastructure. A ballot measure in Santa Cruz County would provide new revenue for transportation projects by increasing the sales tax by 1/2 cent over 30 years. The expenditure plan calls for substantial investments in biking that will total at least $100 million, including funding for the Monterey Bay Sanctuary rail trail. Measure L will raise new revenue for roadways in Stanislaus County by increasing the existing sales by tax by 1/2 cent for 20 years. A significant percentage of this new revenue would be dedicated to bicycle projects —at least $50 million of the $480 million total. Measure AA will raise the sales tax rate in Venture County by 1/2 cent during the next 30 years to fund several transportation initiatives. The measure will raise a total of $3.3 billion and allocate $99 million to bicycle and pedestrian projects. Residents of Broward County will vote on a pair of questions this fall, which would increase the sales tax rate by 1% for 30 years in order to fund various transportation and infrastructure improvements. These would include a number of bike lanes, complete streets initiatives, and traffic calming measures through the county. Voters must pass BOTH questions in order for the tax to go into effect. In one of several transportation related issues on the ballot, voters in Atlanta will decide whether to raise the sales tax by .4 cents for five years in order to raise $260 million for infrastructure projects. $213 million of this money will be spent on bicycle and pedestrian projects, including work on the Atlanta Beltline trail, complete streets projects and investments in bikeshare. Residents of the Township of Grand Haven will vote on a proposition to provide dedicated funding for a system of bike paths around the town. The funding would be generated by a property tax of 45 cents per $1,000 of valuation, and would continue for 20 years. The measure is anticipated to generate approximately $300,000 annually. Rhode Island has put forth a $35 million Green Economy Bond, which would fund a variety of projects related to parks, open space, and recreation. Most importantly, the bond would provide $10 million to expand the state’s bikeway network. A transportation measure will appear on the ballot in the City of Austin that will generate $720 million for investments in transportation. This will include $120 million in bike and pedestrian projects, including new paths, bike lanes, sidewalks and funding to implement a Safe Routes to School Program. The City would issue bonds to raise the $720 million, and the bonds would be paid for with an increase in property taxes. The estimated increase is 2.25 cents per $100 of property valuation, or $56 on a $250,000 home. Voters in Arlington County will be presented a referenda asking them to issue new bonds as part of the County’s capital improvement plan. The plan contains major investments in Arlington Bikes—an initiative to build out the county’s bike infrastructure with new trails and roads. It also includes investments in bikeshare. Voters in Burlington will vote on two questions this year that will affect the quality of bike riding in the city. Question 1 will ask whether the city should issue a $27.5 million bond to fund infrastructure improvements. The bond is part of a capital improvement strategy that will would include a $12.5 million investment in the waterfront bike path to modernize the facility, as well as much needed repairs to streets and sidewalks. Question 4 will provide funding for improvements to downtown streets and re-establish crucial arteries that were cut off by previous development. In a statewide ballot question, voters in Maine will decide whether the state should issue $100 million in bonds to fund transportation projects. Bicycle and pedestrian infrastructure would be eligible for a $20 million segment of the bond proceeds that could be used for transit, aviation and port projects. Measure B would generate new revenue for road projects in Sacramento County by increasing the sales tax by 1/2 cent for 30 years. While the expenditure plan does not fully outline a dollar amount for bicycle projects, the plan includes investments in complete streets, and implementing bicycle master plans in several cities. Washington County residents will be presented with a proposition to increase the county sales tax by .25% on November 8. This revenue would be spent on a range of transportation improvements throughout the county, including improvements for multi-modal access such as bike paths. The measure is expected to raise approximately $4.2 million annually. While the tax has no expiration date, planners have examined the effects of the tax on the county’s road congestion over a 25-year timeline. Voters in Teton County Wyoming will have the opportunity to vote on the continuation of a 1% sales tax that will soon expire. The tax proceeds would go be placed in the general fund and are intended to replace an expiring tax that funds a variety of public improvements, including bicycle and pedestrian infrastructure. The continuation of the tax would generate approximately $11 million annually and would be in place for at least four years. Residents of Bellevue, Washington will have the opportunity to improve their transportation system with new neighborhood safety, connectivity and congestion improvements. Proposition 2 would increase property taxes by 15 cents for every $1,000 of assessed value, generating $140 million over 20 years for upgrades to the city’s sidewalks, trails, and paths, as well introducing traffic calming measures and improved technology for safety management. Measure A will provide continued funds to invest in the County’s park and trail system. The measure would raise property taxes by 1.5 cents per square foot for the next 35 years, replacing an existing tax that is set to expire in 2019. This will generate $94.5 million per year to upgrade various park facilities, including new bike paths. Voters in Monterey County will decide whether to maintain existing funding for the Monterey Peninsula Regional Park District. Measure E would replace an expiring tax that provides the Park District’s funding, ensuring a long-term revenue source for park operations and improvements. The tax would remain in place until repealed by voters. Voters in Napa County will be presented with a parks and open space measure in November, which would raise the sales tax by .25% in order to raise $8 million per year for 14 years. The funds would be used build out the County’s open space system, including improved access for the public via new trails. Paid for by the PeopleForBikes Coalition, 1966 13th St. Suite 250, Boulder, CO 80302. Not authorized by any candidate or committee.